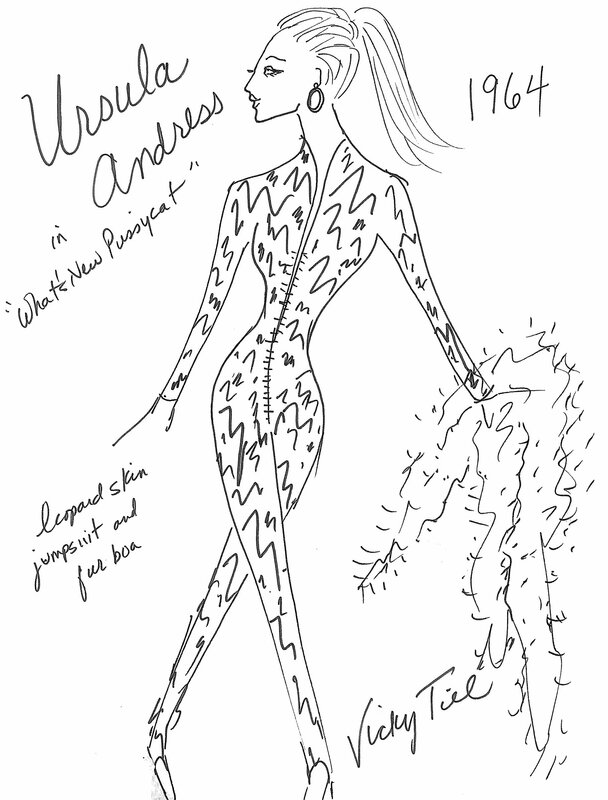 Ursula Andress wore a skintight leopard print cashmere jumpsuit, in the film “What’s New Pussycat”, in a scene with Peter Sellers. 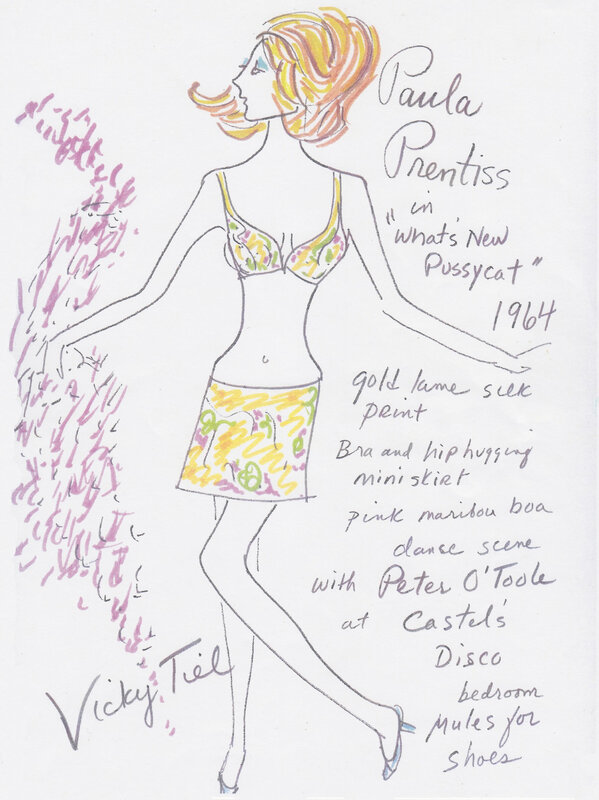 In a night club scene in the film “What’s New Pussycat”, Paula Prentiss wore a gold silk lame print bra, a low slung mini skirt, and an ostrich boa. 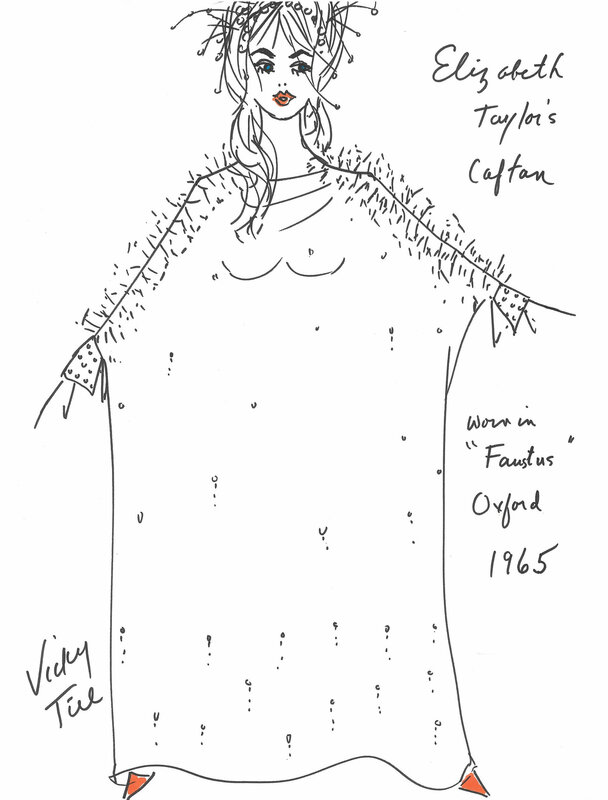 Elizabeth Taylor’s Caftan was worn in the film “Doctor Faustus”, released in 1967, filmed in Oxford, England. 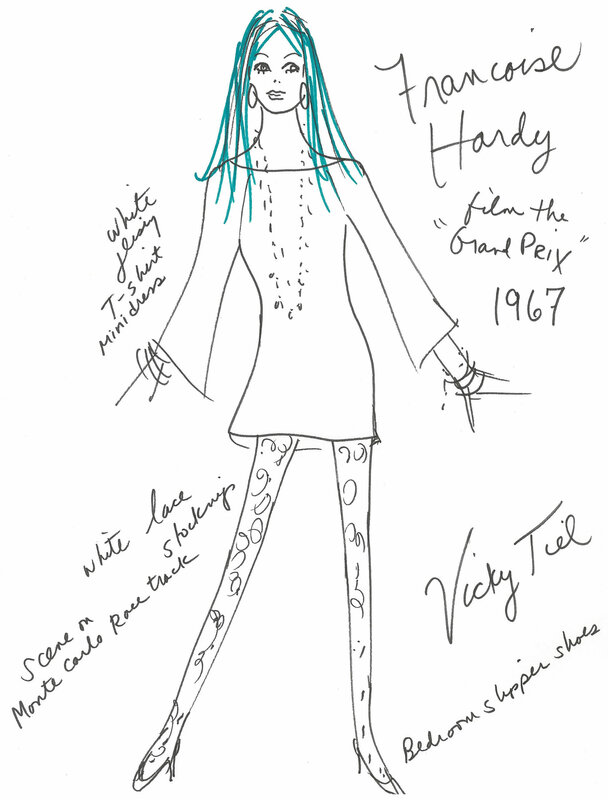 Francoise Hardy, the French singer, wore a white knit mini dress and white lace stockings in the film “Grand Prix”, filmed in Monte Carlo during the races. Brigitte Bardot, bought the first string bikini from the Mia-Vicky shop when it opened in May 1968. 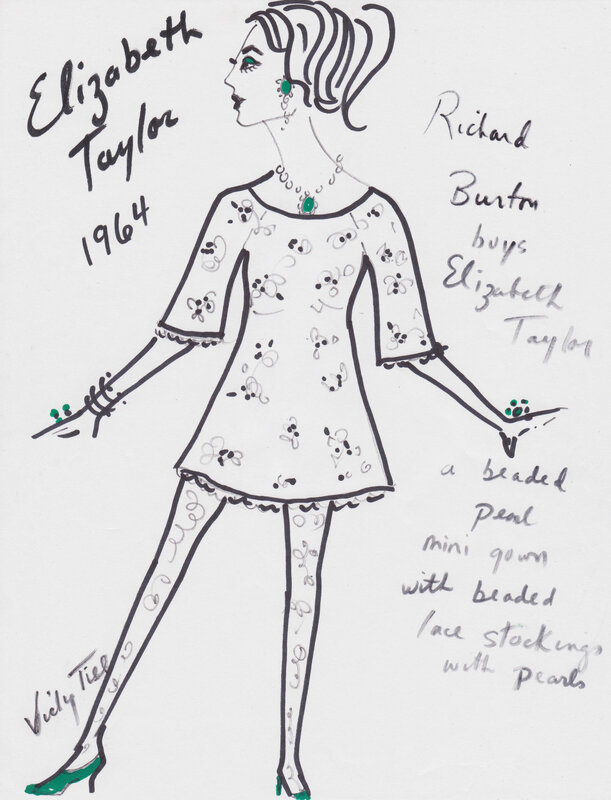 The bikini was made of three triangles of pink jersey knit, and strings. 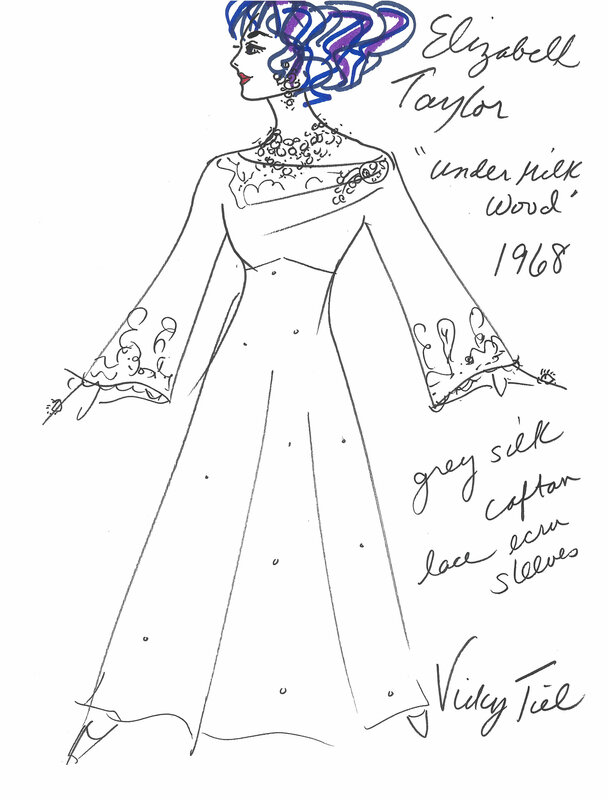 Elizabeth Taylor wore a grey velvet hand beaded gown in the film “Under Milk Wood”, based on a Dylan Thomas play. 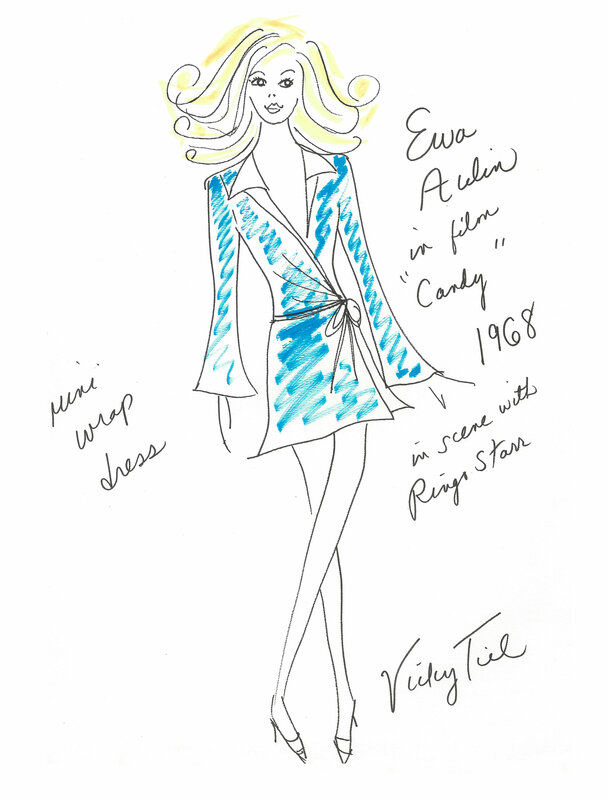 Ewa Aulin wore a mint green rayon mini satin wrap dress with a white collar and side tie in the film “Candy “ in a scene with Ringo Starr, It was the first wrap dress with the set in sleeve, side belted, and flared bias skirt ever seen. 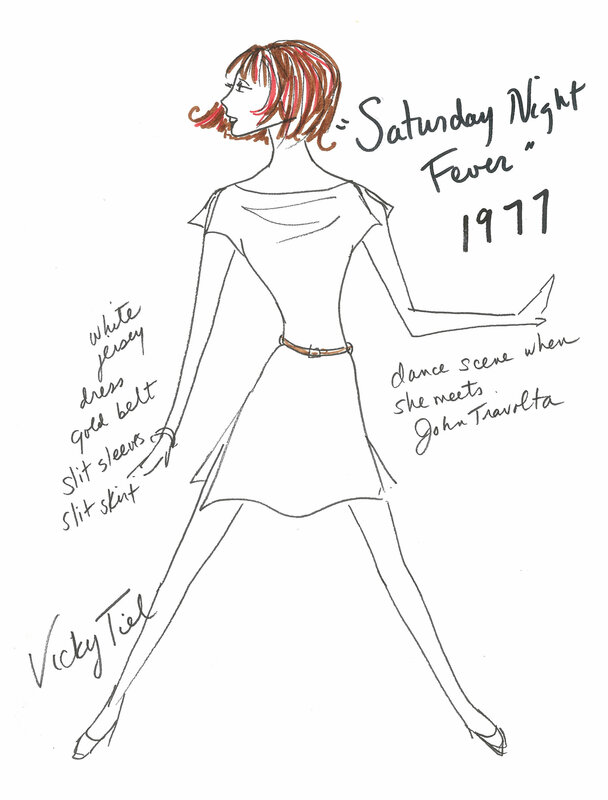 Jean Seberg wore an off the shoulder ruffled smocked gown, with white organdy details, to the opening of the Vicky Tiel boutique in Paris. 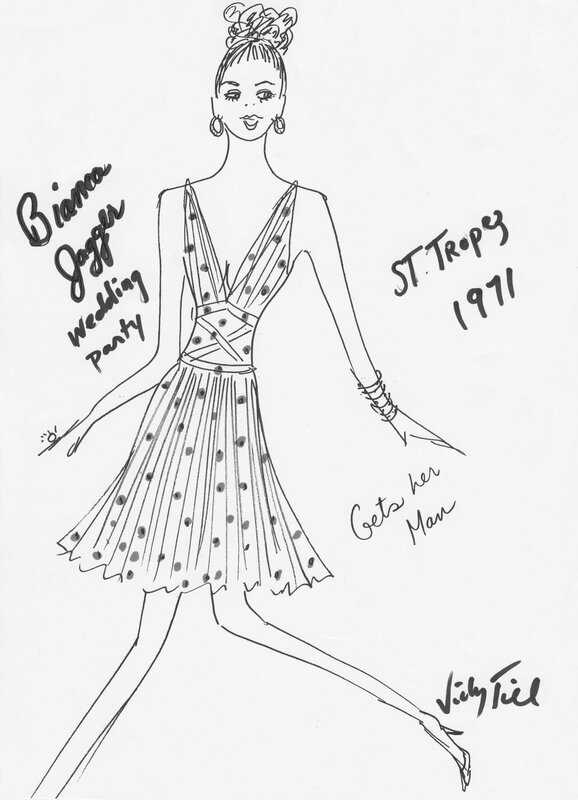 At the St. Tropez party after her wedding to Mick, Bianca Jagger wore a “Marilyn” style dress made of white silk with green polka dots ,and a “soleil” pleated skirt. 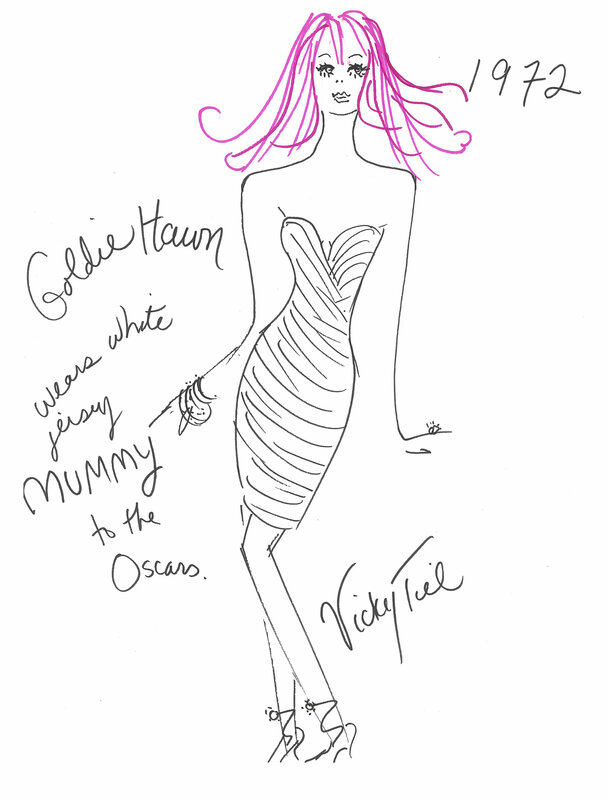 Goldie Hawn wore a white draped short Mummy dress to the 1972 Oscars. 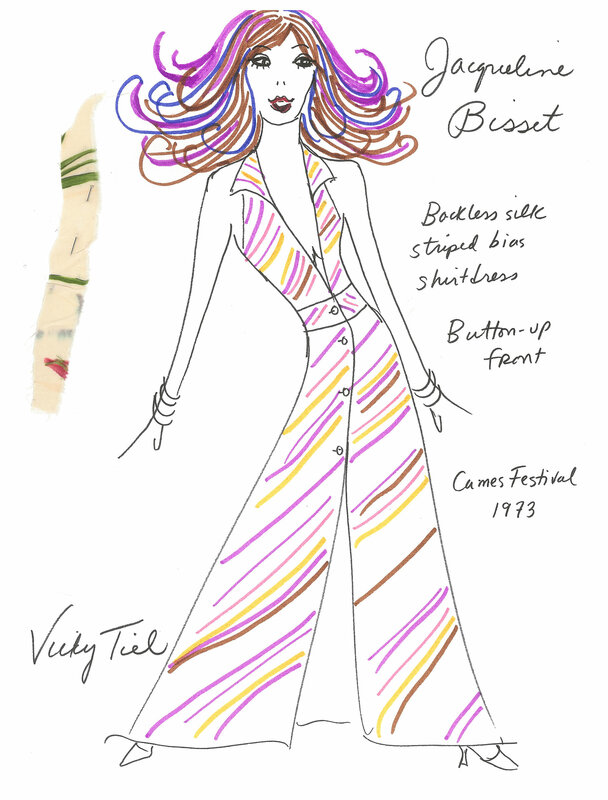 Jacqueline Bisset wore a backless rust and pink cotton bias stripe shirtdress, all unbuttoned, to the Cannes Film Festival. 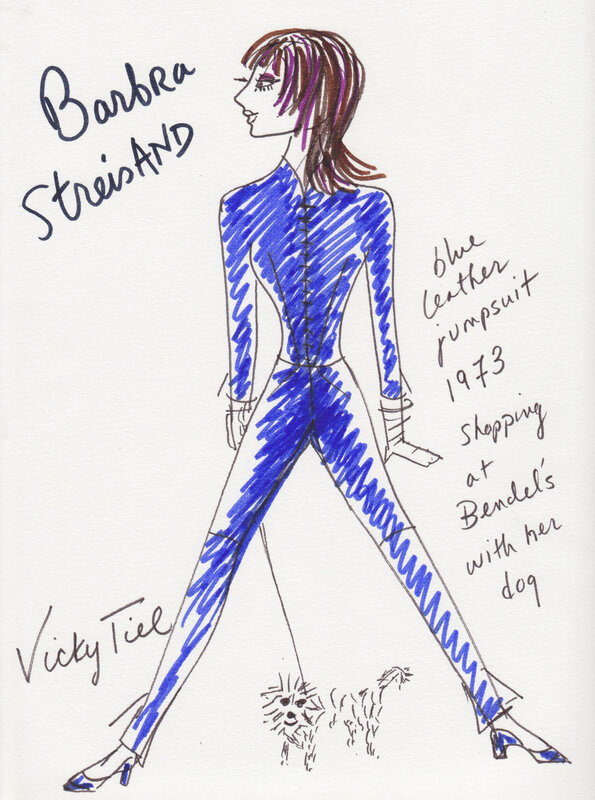 Barbara Streisand purchased two tight leather jumpsuits from Henri Bendel in 1973, one in navy, and one in red. 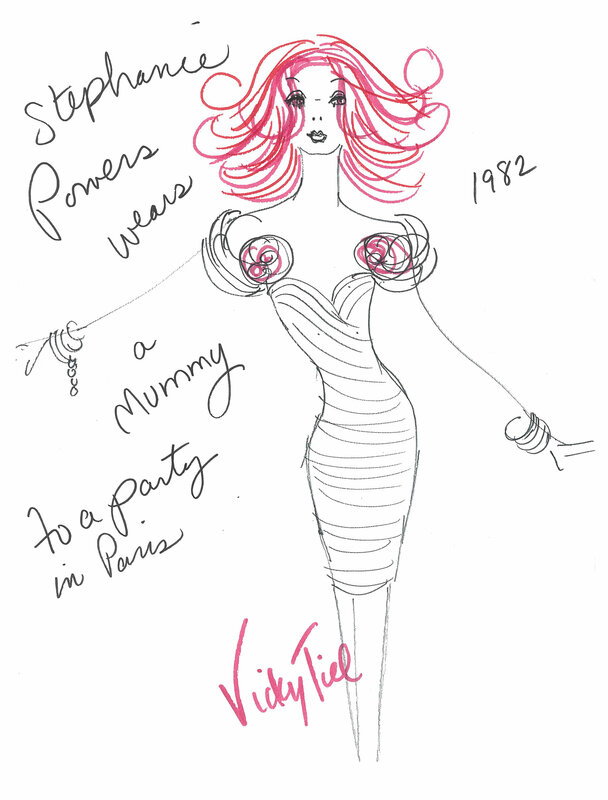 Stephanie Powers wore a draped silk taffeta mummy dress, with silk roses on the draped sleeves, to a party in Paris. 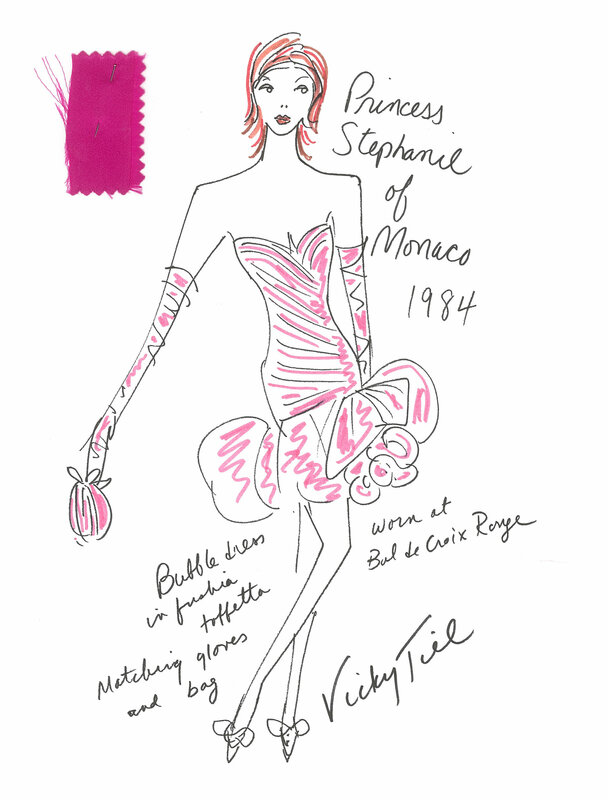 Princess Stephanie of Monaco wore a fuchsia taffeta pouf bubble dress, with matching hand made gloves and bag, to the Bal de Croix Rouge in Monaco. 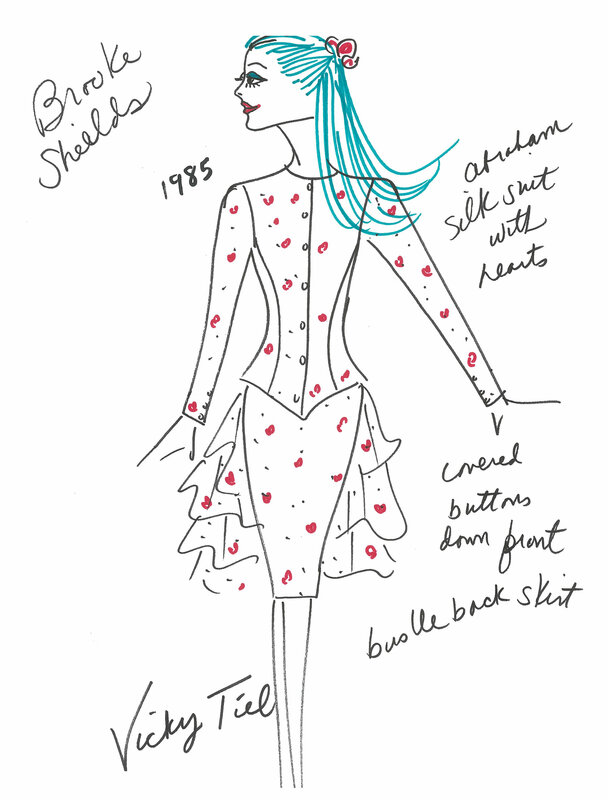 Brooke Shields wore a silk suit with a bustle back skirt in a French print with hearts and dots in Vogue Magazine. Christie Brinkley wore a short red satin duchess dress, with large side bow, in a photo with Billy Joel, and their baby, for Harper’s Bazaar. 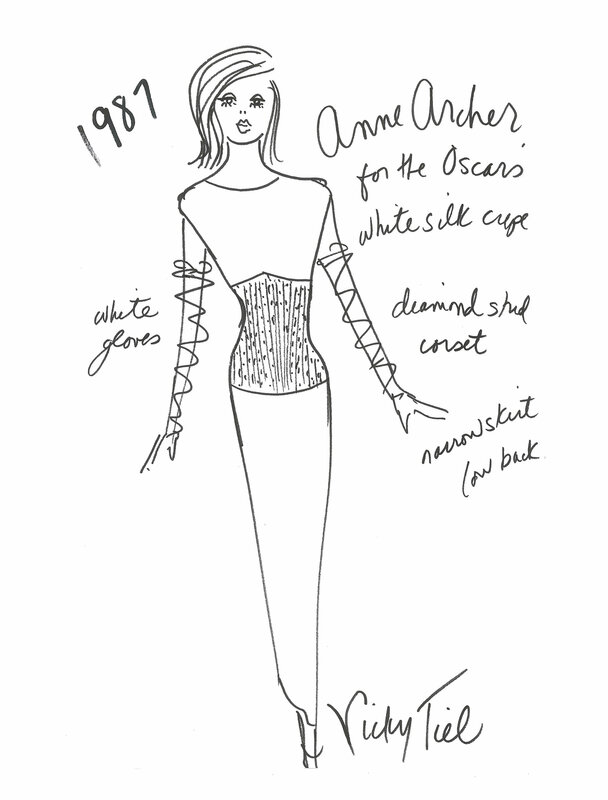 Anne Archer wore a white silk 8 ply crepe gown, with silver beaded midriff, to the Oscars. 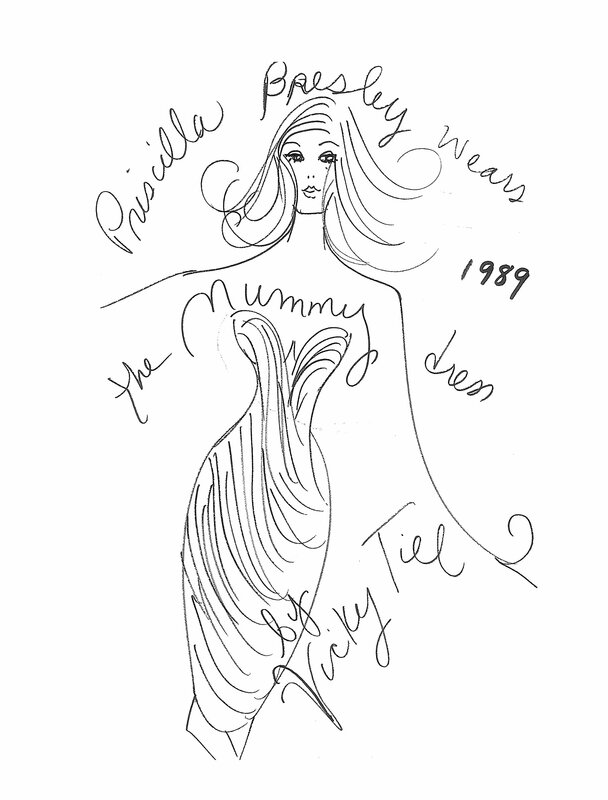 Priscilla Presley wore a white strapless Mummy dress to a party. 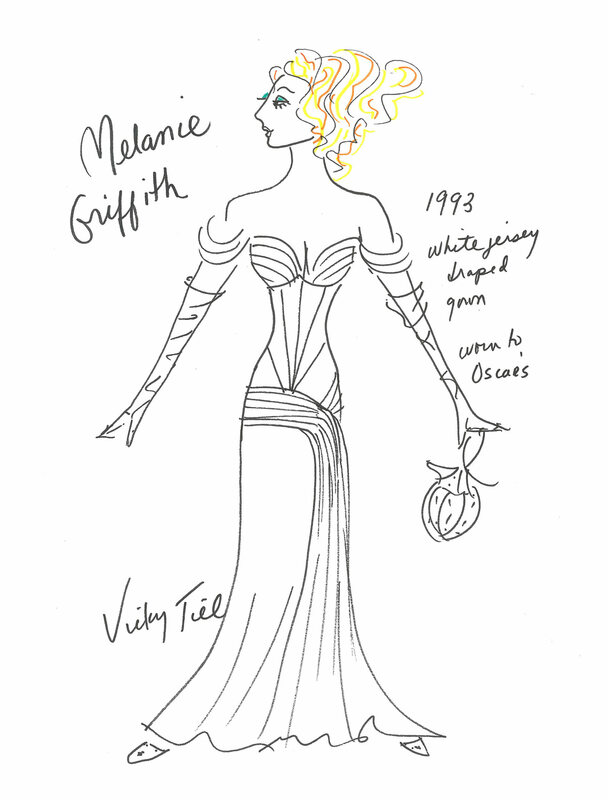 Melanie Griffith wore a “Pretty Woman Dress”, in white matt jersey, to the Oscars. 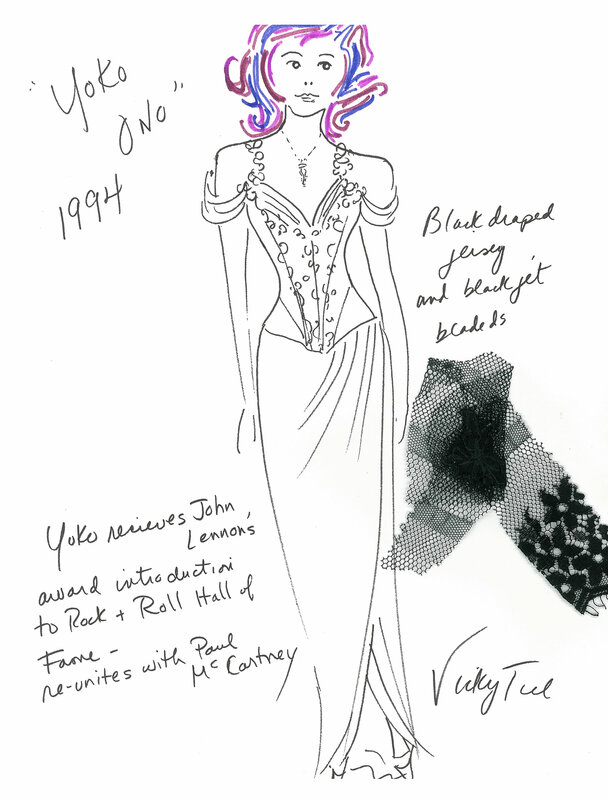 Yoko Ono wore a black beaded jersey corset dress, with wrap over skirt, to John Lennon’s induction to the Rock and Roll Hall of Fame. She was reunited with Paul McCartney at that event. 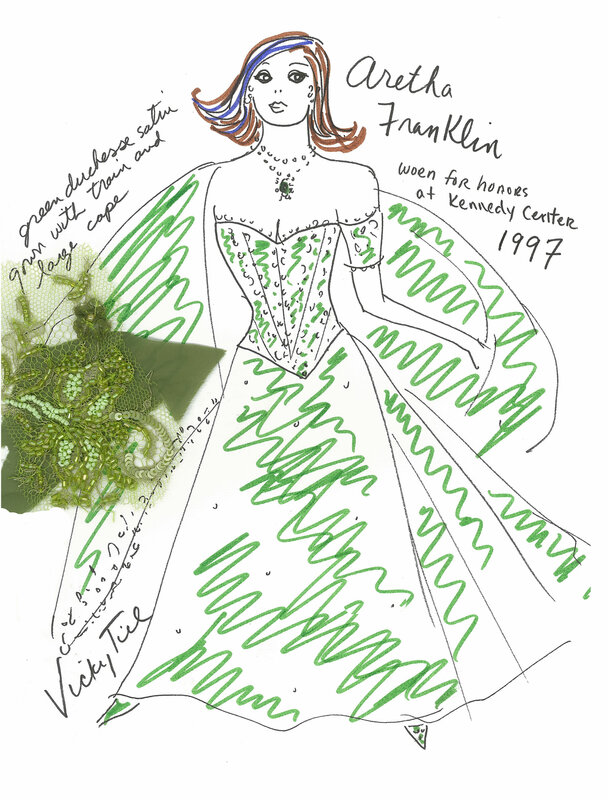 Aretha Franklin wore a strapless green satin duchess ballgown, with couture beading and matching stole, for receiving her honors at the Kennedy Center. 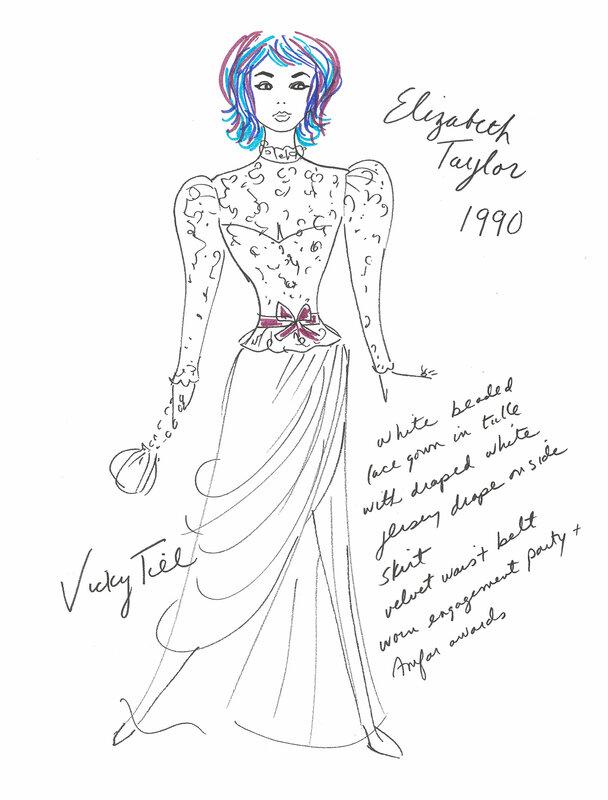 Whitney Houston wore a longsleeve black long jersey sheath, with low lace back, while on tour, along with her longsleeve Mummy gowns, now called “The Whitney”. 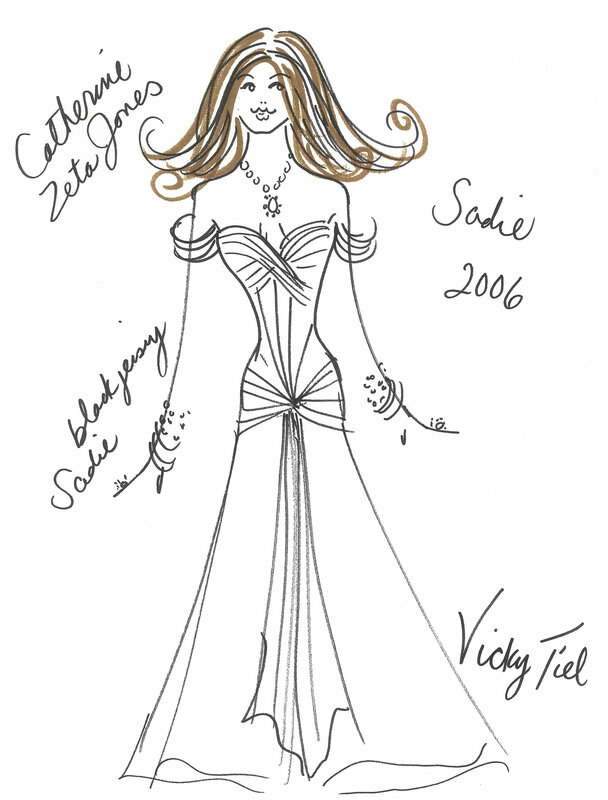 Catherine Zeta Jones wore the Sade “Pretty Woman Dress”, in black jersey, to the National Board of Review of Motion Pictures Awards Gala in New York City. Halle Berry wore a short lace corset dress, with see thru lace godet slits, to the Cannes Film Festival. 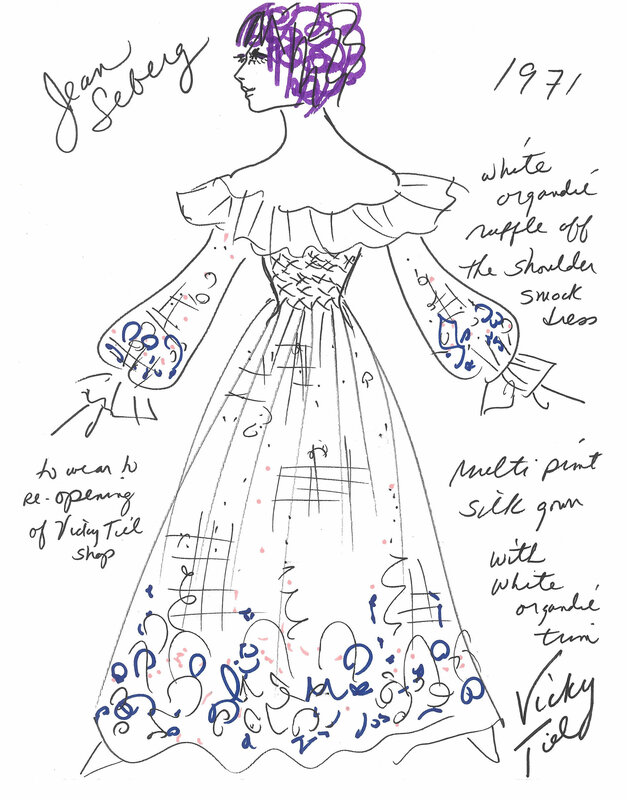 People Magazine wrote that she wore one of the best dresses of that year. 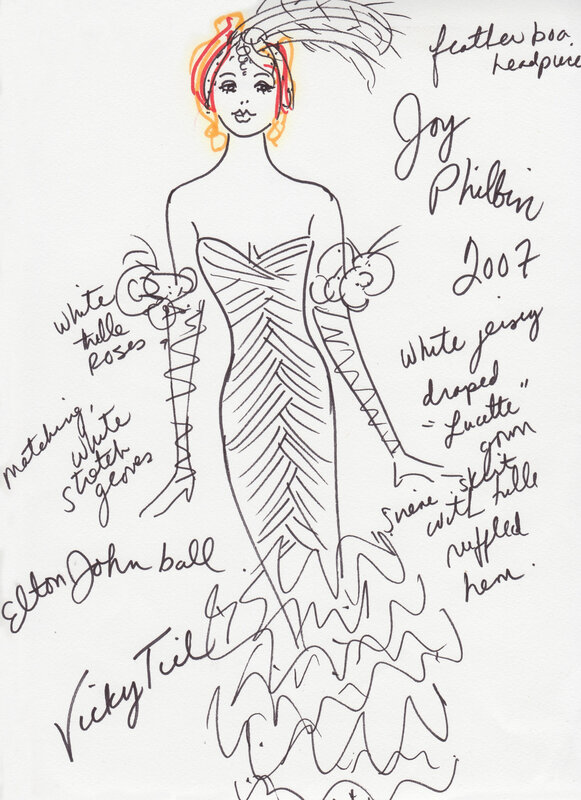 Joy Philbin wore a white draped jersey gown, with a tulle ruffled hem and fabric roses to the Elton John Charity ball. 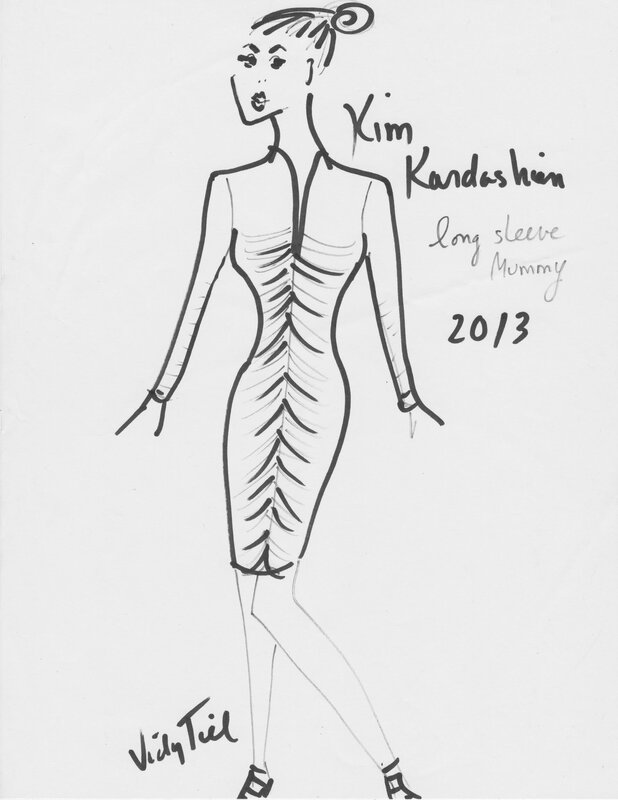 Kim Kardashian wore a brown, center seam draped, long sleeve Mummy dress to the Cannes Film Festival.